Surgical Tech's GET EXCITED as this article may just change your life!!! Recently I was talking to a surgical technology professional who also happens to be a Director of a Surgical Tech Program. Now, in order to respect my colleague & friend's privacy, I won't tell you this persons name but we'll call them JT. JT & I were talking about the surgical tech field & opportunities in and around the surgical tech world. I have known JT for a number of years and have always had a high regard for this person as an educator, surgical professional, colleague & friend. JT is an experienced surgical tech professional who has utilized their surgical tech experience & education to become a recognized program director. Well, the reason I contacted my friend was to introduce them to a surgical tech professional opportunity I was approached with but unfortunately just could not fit into my schedule. You see, recently I was approached by a college that wants to start a surgical tech program. They contacted me to help them set up a curriculum for a new ST program. But as I mentioned, due to my current circumstances, I had to refer them to another surgical tech professional, my friend & colleague JT. Well, to cut to the chase here and make a long story short, JT was more than willing to work with this school and help them get a surgical tech program started. However, after speaking with JT a few times about the process and how to approach this opportunity, I realized there was something that was missing in JT's attitude or feeling about their current surgical tech experience & knowledge base. It came to my attention that, although JT knew they were qualified to write a ST curriculum, a little self-doubt had set in about jumping in with both feet and being able to deliver the type of quality information I know JT is capable of delivering. You see, although JT is an accomplished and successful surgical professional who has written ST curriculums in the past, the self-doubt that we all deal with from time to time crept into JT's mind and I realized that they did not quite grasp the extent of their surgical tech specialized knowledge base and the value of this set of specialized & unique skills. may just change your life!!! An education and experience in surgical technology is a specialized skill set & knowledge base that can open up the doors of opportunity that you might not even realize right now. Based on a surgical tech background, there are opportunities out there that many of you are unaware of or just never even thought about. JT is not alone when it comes to needing a little pep talk about how they are a surgical technology expert with skills and a knowledge base that is extremely valuable & in demand! As a surgical tech professional who has worked their way up into a program director position, the knowledge base this person has attained is priceless! Therefore, JT is in a position to sell the knowledge & experience they have attained to others who are looking for the specialized knowledge and skill set that a surgical tech professional possesses. Now, this newsletter is not about writing curriculums! Rather, I want you to get excited and know that a surgical tech education & experience is only the beginning of what may lie ahead of your surgical career. With a surgical tech background, education, & experience, you have put yourself into a specialized position that most people will never even strive for. This specialized education & training of a surgical tech can put you in a position to market yourself beyond the average career success if you simply think a little bit outside the box. Now the obvious "inside the box" thinking is to scrub on cases as a surgical tech, work some call or overtime, and learn all that you can learn about the specialties in your facility. Thinking "inside the box" can provide you with a great career and feeling of accomplishment. If you are set on scrubbing as your career choice and staying "inside the box", FANTASTIC!!! Do it with all your heart and be the best scrub tech you can be!!! Whatever your specialty is, be the best at it. Whether you scrub for a surgeon on a private level, or you scrub in a Level 1 Trauma hospital, or you're a traveler, or you scrub at an out-patient facility, or your on the endoscopy team, or L&D unit, or neuro team, or whatever level you're on, BE THE BEST at what you do and you'll be amazed at how the doors of opportunity will start to open. On the other hand, if you want to look into other avenues of surgical career success; Start thinking outside of the box, tap into & broaden your specific knowledge base and/or specialty, and start thinking about ways to market your skill set as a surgical tech professional. Know that your specialized experience in the surgical tech arena can open up doors of CAREER OPPORTUNITIES & SUCCESS if you simply realize that your skill set is unique and has the potential to create avenues of career success that are just waiting for you to turn towards. Now, I'm not just trying to get you all pumped up but I hope you do get pumped up because the reality of a surgical tech background really does have the potential to create more surgical career success than you might realize. I speak from personal experience as all of my surgical career success is founded upon a surgical tech background and the experience I've obtained throughout my years in and around the surgical world. I've met other surgical pro's who started as surgical techs and are now successful educators, sales reps, first assistants, nurse's, surgeons, consultants, entrepreneurs, writers, company owners, and the list can go on and on. GET EXCITED because your surgical tech education and/or experience is only the beginning of what can be. 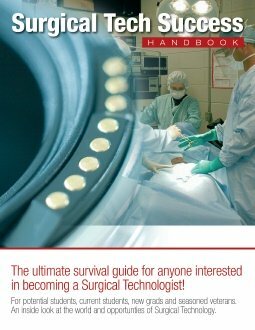 Surgical techs posses a unique and specialized set of skills and knowledge that has the potential to create a super successful career in and around the surgical world.